Since its launch in 2010, Autograph Collection has celebrated individuality, bringing one-of-a-kind hotels to guests seeking a stay with a story. With a tagline of ‘Exactly Like Nothing Else’, properties in the portfolio are selected for their rich character, stand-out design and experiential offer. 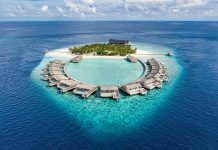 There’s no cookie-cutter approach or rigid set of brand standards to adhere to, rather hotels are independent, maintaining their own name, logo and identity while benefitting from the booking engine of the world’s largest hotel group. Despite it’s inability to roll-out in the typical way, Autograph is one of Marriott’s fastest growing full-service brands, expanding from a base of five hotels in 2010, to – at the last count – a portfolio of 153 properties open with a further 77 in the pipeline. The reach is global, with members including The Stones Hotel in Legian Bali, Pier One at Sydney Harbour and Habtoor Grand Resort in Dubai along with European properties such as The University Arms in Cambridge, Cotton House Hotel in Barcelona and Domes of Elounda in Crete. 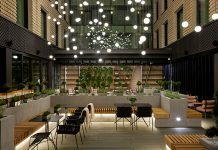 The bulk of the portfolio is in North America however, where the likes of Hotel EMC2 in Chicago, The Cosmopolitan of Las Vegas and The Lexington Hotel in New York contribute to a 20,000-strong key count across the continent. The state of Florida has the highest concentration of Autograph Collection hotels, while California has been something of a breeding ground for the brand of late, seeing the addition of three new properties this year alone. 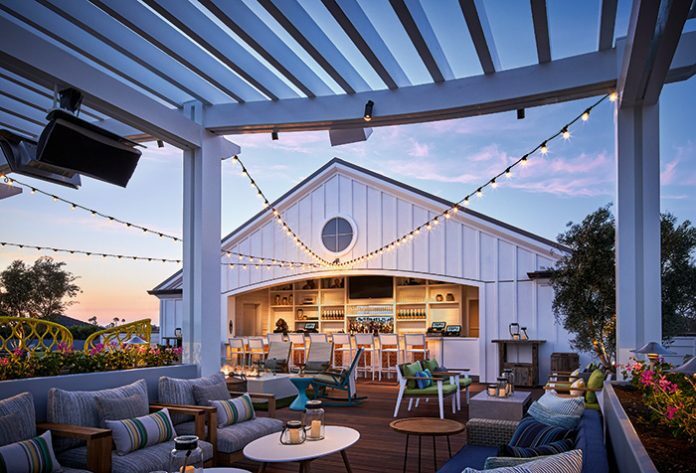 The new supply – Lido House in Newport Beach, Westdrift in Manhattan Beach and Hotel Republic in San Diego – isn’t so much of a deliberate push in the state, but more opportunistic, and coincidental that all three should debut within months of one another. Dotted along California’s Golden Coast, the new additions are a great showcase for Autograph Collection, and earlier this year, Sleeper joined Marriott on a road trip to experience the brand first-hand. Autograph Collection has had strong interest from the franchise community since its launch, and the passion of the owner is at the heart of each individual property. This is particularly true at Lido House, where Robert Olson, founder of R.D. Olson Development, was personally involved in every aspect of bringing to hotel to life. The self-made entrepreneur has worked with Marriott for decades, having developed a number of properties for the Courtyard and Residence Inn brands across California and beyond. But Lido House is different. Living so close, Olson felt he had a responsibility to make the hotel a place for the community as much as for visitors. As such, the grand opening party was a local affair, with Newport Beach residents top of the guest list, and musical entertainment provided by Aloe Blacc, an internationally-known singer who grew up in Orange County. The celebration was clearly a proud moment for Olson, one that saw him personally seeing to the needs of hotel guests as well as rubbing shoulders with locals. 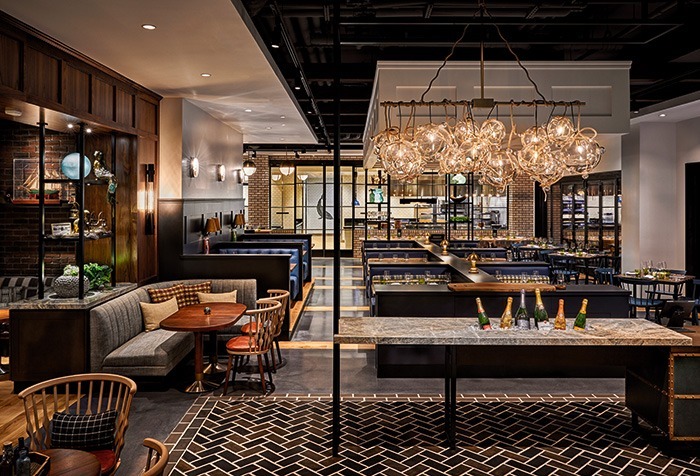 At Hotel Republic in San Diego, the local connection comes in the form of the F&B programme. Located in the heart of downtown’s civic district, the 258-key property has partnered with San Diego-based hospitality firm The Patio Group to create three distinct dining venues: Topside Terrace Kitchen & Bar, a rooftop bar and lounge; Trade, a chic cocktail bar and restaurant; and Patio Marketplace, a quick-service casual, streetside café. The Patio Group operates a number of restaurants and private dining events spaces across the city, each with its own identity yet guided by the same culinary values of sourcing sustainable, seasonal, quality ingredients and cooking them with care. It is this philosophy that the group brings to Hotel Republic. The three venues are overseen by Executive Chef JC Colón, who has worked with several of San Diego’s top hospitality groups. When he’s not in the kitchen dreaming up new flavour combinations, Colón can be found out front, picking produce from the farmers’ market truck that stops by daily. The nearby farms that supply the hotel are listed on the menu, further enhancing the local connection and helping to create a hotel with a sense of place. Reflection of place and mark of craft – signature moments and experiences unique to each property – are core pillars of the Autograph Collection, coming together to create hotels with personality. The third, and arguably most important, is design. While Lido House, Westdrift and Hotel Republic share the same coastline, the design of each is markedly different. Lido House has been designed by WATG; its scheme inspired by the quaint cottages of Cape Cod. 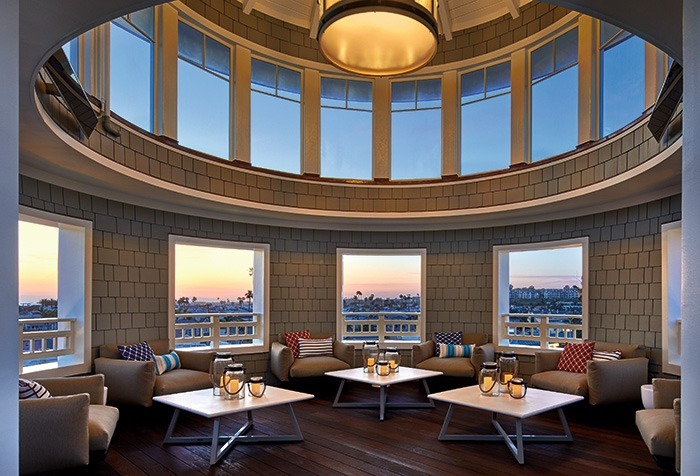 The architectural character is defined as ‘Newport Beach nautical’ – a West Coast interpretation of the East Coast Cape Cod style – with brick, shingle siding and shuttered windows accompanying a rooftop turret, the silhouette of which forms the hotel’s brand identity. The look continues through to the interiors, designed by California-based studio EDG. Joining Sleeper for a tour of the property, the firm’s President and CEO Jennifer Johanson revealed that the design was based on the fictitious tale of a fisherman who brought the heritage of the East Coast to Newport. It is a refined celebration of Southern California’s coastal lifestyle, with public spaces extending outside for an indoor-outdoor feel. Lido House has three distinct F&B venues, its signature restaurant being The Mayor’s Table. Honouring the site’s city hall roots, the scheme takes on a more masculine style with the use of dark woods, steel and glass along with industrial light fittings. There are plenty of nautical touches however, with trinkets such as model boats and mermaids dressing the shelves. The hotel’s crowning glory is Topside, a rooftop bar that overlooks the hotel’s lawn and pool, and out to the harbour beyond. It’s the ultimate spot for a post-beach soirée, with open fire pits, festoon lighting and a cosy VIP snug within the turret. Guestrooms are designed to represent a ship’s cabin – albeit more spacious – with millwork framing the bed and TV, and a palette of navy and brass. 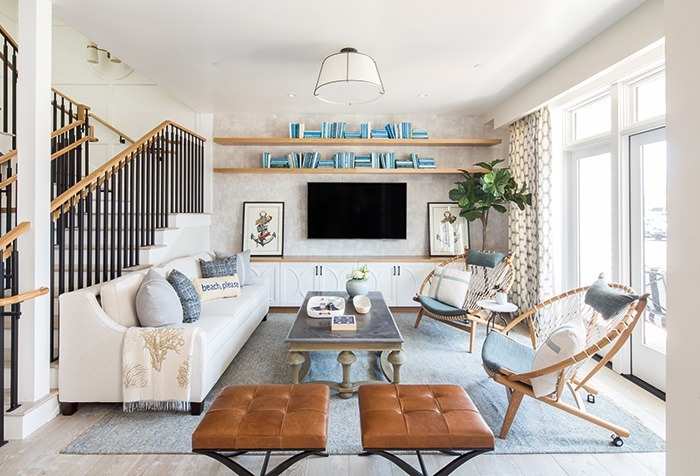 For longer-stay guests, Lido House has five residential-style cottages, each the creation of a different local designer and boasting it’s own private entrance, rooftop patio and 1,300ft2 of living space. 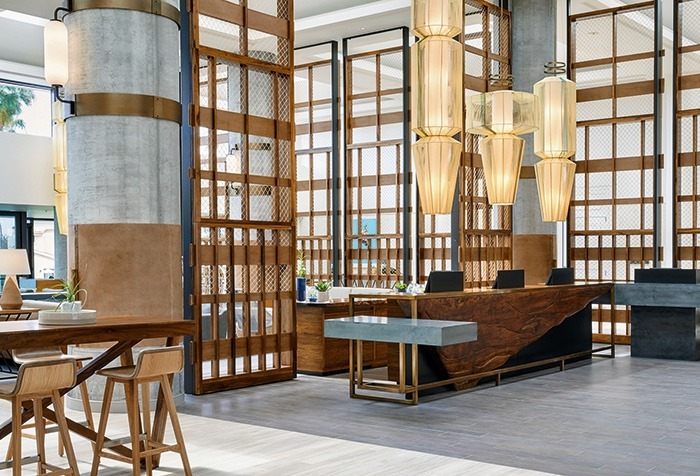 The lobby design is based on Manhattan Beach Pier, with a custom-made driftwood check-in desk framed by towering columns that reference the time-worn supports beneath the local landmark. The columns feature leather and metal accents to represent water staining while wood and mesh screens reference the nets of local fishermen. The restaurant, Jute Coastal Bar + Kitchen is named after the raw fibre often used to make rope, with its design scheme featuring woven chairs and string flags. Large-scale water paintings by Sausalito photorealist Eric Zener line the walls of the lobby, a smaller version of which can be seen in the guestrooms alongside a sun-washed palette, natural textures and splashes of blue. 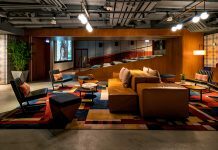 At San Diego’s Hotel Republic, converted from a W Hotel by ownership group RP SCS WSD Hotel, the design story is more energetic, in line with the district’s new lease of life as a social and business hub. San Diego-based Bluemotif Architecture and Los Angeles interior design studio Forchielli Glynn took cues from downtown’s urban coastal palette to furnish the property, employing neutral tones, natural leathers and coffee tables fabricated from reclaimed solid elm beneath driftwood chandeliers hanging over the lobby. The openings of Lido House, Westdrift and Hotel Republic mark a significant milestone in the expansion of Autograph Collection in California. That three hotels along the same stretch of coast have such different stories to tell is a credit to the design teams involved. And there’s more to come from the brand, as it’s revealed the state will welcome six more Autograph Collection members in the coming years. While the locations and design concepts are yet to be announced, one thing’s for certain; each will remain true to the brand promise of delivering an experience exactly like nothing else.